Wales should select Matthew Morgan at full-back over Liam Williams for next Sunday's Six Nations opener in Ireland, says former captain Gareth Thomas. Williams, the only recognised full-back in Wales' squad, made his comeback from injury in Scarlets' loss at Connacht on Saturday, coming through 61 minutes. "I'd start Morgan. For Liam Williams, after one game, to go to Ireland away is a big ask," Thomas told Scrum V.
Injuries to Leigh Halfpenny and Gareth Anscombe have reduced Wales' options. Morgan, 23, who can also play at fly-half, is set to leave Bristol for Cardiff Blues at the end of the season. His future head coach, Danny Wilson, has previously backed calls for him to feature at 15, as has legendary former Wales wing Shane Williams. But Scrum V pundit and former England international Jeremy Guscott believes Wales do not need to use Morgan at full-back. "Liam Williams - I don't even think it's a gamble," Guscott said. "He's ready. "He's got quick feet. He's an attacking-minded player." 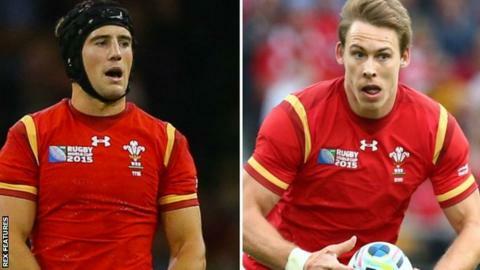 Former Wales flanker Martyn Williams agreed, adding: "To start, I'd go with Liam Williams at 15. "In a Test match, I think adrenalin will get him through fine." Who is on the wing? On the wings, one of Alex Cuthbert (left), Tom James and Hallam Amos could start for Wales, with George North expected to play on the left wing. The competition for a starting spot is "very open" but Thomas feels Blues' James should be selected. "I'd go with Tom James. He's got a great left foot. We need to take some of the pressure off (fly-half) Dan Biggar," Thomas added on Scrum V.
"Hallam Amos - I'm a huge fan. And Alex Cuthbert has answered a lot of critics. But there's still a way to go. "I hope in this Six Nations Wales will show an attacking threat. Sometimes Wales go out to defend a game, rather to go out there and win." Thomas, Martyn Williams and Guscott all told Scrum V they believe Wales will win the upcoming championship, but Thomas warned against underestimating a wounded French side. "A French team that is unpredictable and has the right to go out and play, is very dangerous," said Thomas. "They've had a disappointing last few Six Nations and a disappointing World Cup. "I truly believe the French players thrive on unpredictability." France kick-off the Six Nations on Saturday when they host Italy in Paris, before Scotland host England and then Ireland and Wales meet in Dublin on 7 February.